After 30 matches, teams are divided into three groups - Championship Group, UEFA Europa League Play off Group and Relegation Group. The top two teams qualify for the UEFA Champions League qualifying round, the third qualifies for the UEFA Europa League and the fourth enters the UEFA Europa League Play off Final. The 14th and 15th placed teams in the Relegation Group will play Relegation Play offs with the top two placed teams in Division 2. The last placed team is relegated. 5. Most goals scored in all matches. 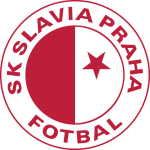 Get all of Slavia Praha latest football results for every football game they have played. See how Slavia Praha has gotten on in the 2018/2019 league tables, cup competitions and friendly games including the Gambrinus Liga, Pohar CMFS, Champions League, Europa League & Atlantic Cup football tournaments. Get every football score, football fixture and football stats for Slavia Praha in the 2018-2019 football season only at ScoresPro - the #1 Football livescore website for Slavia Praha! Get the latest Slavia Praha football scores and all of the Slavia Praha stats for all Gambrinus Liga, Pohar CMFS, Champions League, Europa League & Atlantic Cup games in the 2018-2019 season only at ScoresPro, the #1 football & soccer livescore website for Slavia Praha football!